The triumph of Tsar Ivan Assen (1218-1241) by the Klokotnitsa village near Haskovo has ever since made many generations of Bulgarians feel proud. The numerous army of the Greek Despot Teodor Komnin, ravaging the Bulgarian lands in spite of the agreement between them, was defeated there 776 years ago by our great Ruler. The foreigner was so sure in his victory that he took all his family and his court to the fighting field. Early on March 9th, 1230 (the day of the Saint 40 martyrs) the two armies met near Klokotnitsa River, 10 km to the West of Haskovo. In order to elate his considerably smaller army consisting of Bulgarians and Kumans, Ivan Assen II ordered that the parchment of the violated peace agreement should be stuck on a javelin. In the battle that followed the Bulgarian Tsar displayed cleverness and excellent fighting tactics and managed to put to flight the Byzantines and the Frank soldiers of fortune. 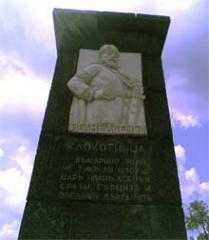 Teodor Komnin himself was captured together with his sons and daughters. The victor ordered that the high captives should be taken to the capital city, and the ordinary soldiers captured be fed and released. Because of his unheard generosity and humaneness, Tsar Ivan Assen II was honoured and loved “not only by the Bulgarians, but also by the other peoples” – wrote a Byzantine chronicle recorder. One legend says that the wounded Bulgarian soldiers were cured in the Haskovo mineral baths of today. The big fair “Bansko All Soul’s Day”, which is part of the local folklore, is said to have taken place for centuries in honour of all the soldiers killed in this battle by Klokotnitsa. Nowadays, all who travel along the E-80 Highway may see the bronze bas-relief of Ivan Assen II near the historical place to commemorate his glorious victory near Haskovo.